Wells Fargo: "Someone Or Someones Are Really Scared"
With just one trading day left in the month and the (very volatile) quarter, which has recently seen the stock of Deutsche Bank plunge to new all time lows dragging down European banks, in which trade war fears have sent Chinese tech stocks and European automotive names tumbling, which has seen the Shanghai Composite enter a bear market and the yield on the 10Y flash crash, in which Emerging Market bonds, currencies and stocks have been pulverized alongside the soaring dollar and oil forcing central bank interventions by the likes of China, India, and Brazil, Wells Fargo's head of equity strategy Chris Harvey summarized the recent action rather simply: "Someone or someones are really scared." ... or fundamental investors who got stopped out from positions in heavily owned industries such as technology, consumer discretionary and banks, while the most shorted names among utilities and real estate jumped, the violent, spasmodic reversals caught many managers off guard and couldn’t have come at a worse time for active-managed funds that are about to mail out their monthly performance reports to soon to be disappointed clients. 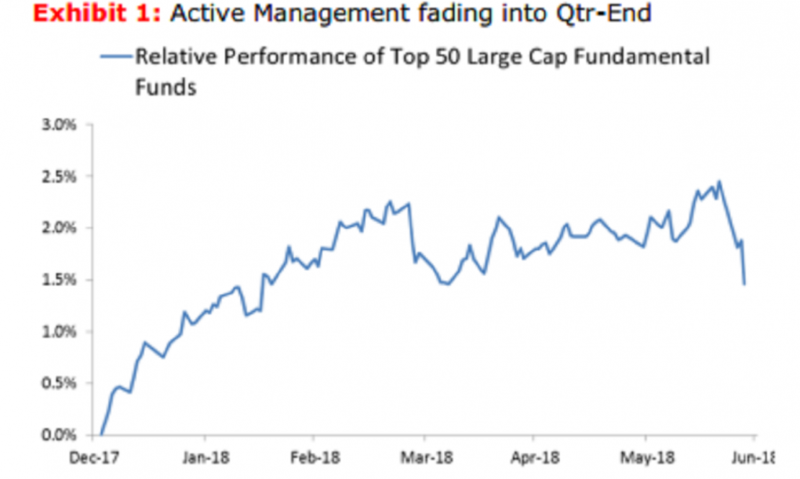 And nowhere is this more obvious than in the performance of the 50 biggest large-cap funds tracked by Wells Fargo, whose alpha was cut in half in a span of days. 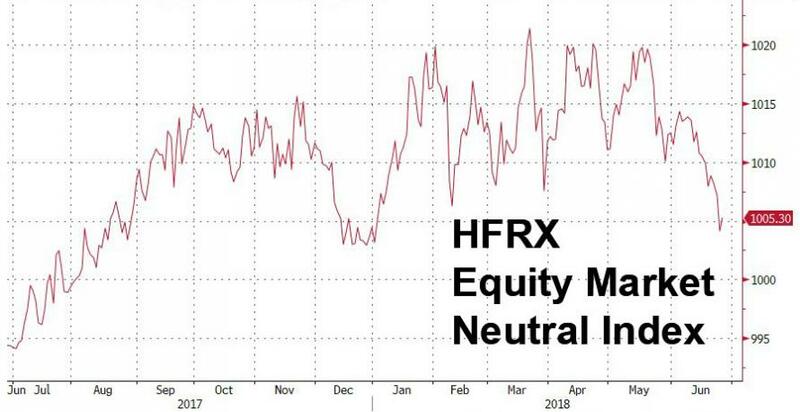 The result is hardly an outcome to Harvey, who writes that "earlier this week, we put forth the belief that ‘long onlys’ had an incentive to trim momentum exposure and possibly increase cash or risk aversion assets. Currently, it doesn’t feel like it can happen fast enough." As a result, traders scrambled to lock in profits for the quarter and volatility spiked, culminating with last Thursday’s sharp intraday reversal as investors rushed to take advantage of the morning rally to exit positions, especially winners: here momentum stocks, which outperformed the S&P in recent months, bore the brunt of selling. As shown above, the iShares Momentum Factor ETF, MTUM, dropped 3% this week, its worst decline in three months. "Thursday’s action felt like the start of an unwind, and unluckily we have a reasonable amount of data to support our fears." 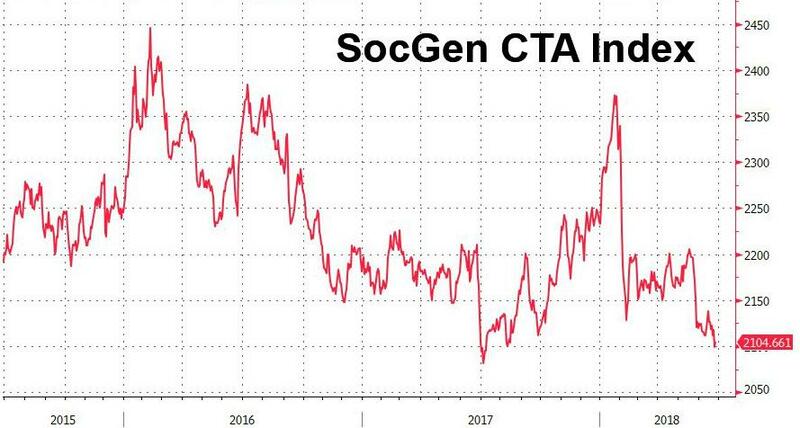 Adding to the confusion, has been the ongoing countertrend rally in Treasurys "despite the economic and inflationary improvement" which have sent a deflationary signal to stocks, which according to Harvey "is providing a significant risk off signal and the fixed income risk-off message is spilling into the equity market." 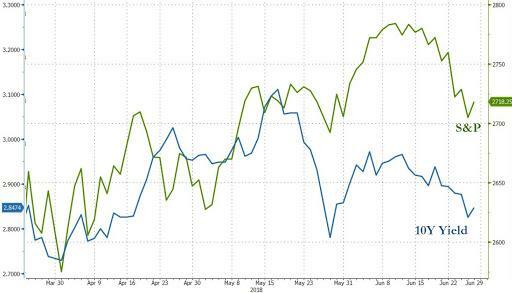 So with the quarter almost over, is the deleveraging over? Judging by today's market action, traders are certainly breating in a sigh of relief, but beware: "into Friday’s close, we expect ‘sloppy’ market action with demands for liquidity eclipsing liquidity providers" Harvey warns, adding that it feels like "acute demands for liquidity will likely arise." Finally, next week's start may not be any better, but for an entirely different reason: as "Macrotourist" Kevin Muir wrote yesterday, on Monday July 2 is when the Fed has some $30 billion in notes are maturing. 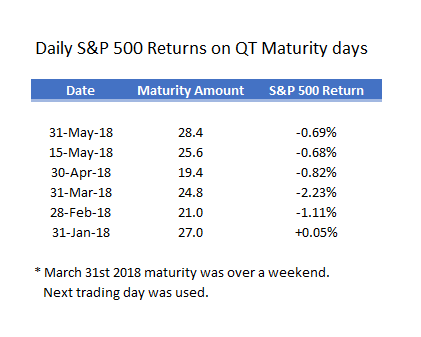 And just like POMO in reverse, historically days of QT maturities have seen sharp drops in the S&P. Muir's conclusion: "Monday July 2nd spooz should trade heavy if this QT theory holds true."